Regardless of what people say, what you wear says a lot about you. If you want to dress the part of a successful man, then nothings says it better than a well-fitted suit. If you’re still working your way up and can’t afford a full suit – then invest in at least one solid jacket. Casual attire isn’t great if you’re dreaming of that corner office, and it’s even worse when you see a guy who’s wearing an ill-fitted suit. You may think finding a suit jacket to fit you in both style and construction would be pretty straight forward, but the devil’s in the details and here are some you should keep in mind when choosing one that will fit you perfectly. A vent is a break in the fabric for comfort. Every guy knows the feeling of sitting down in a buttoned-up jacket. Your weight shifts, and unless you’re a thin guy, you’ve got to unbutton that jacket to breathe and sit comfortably. 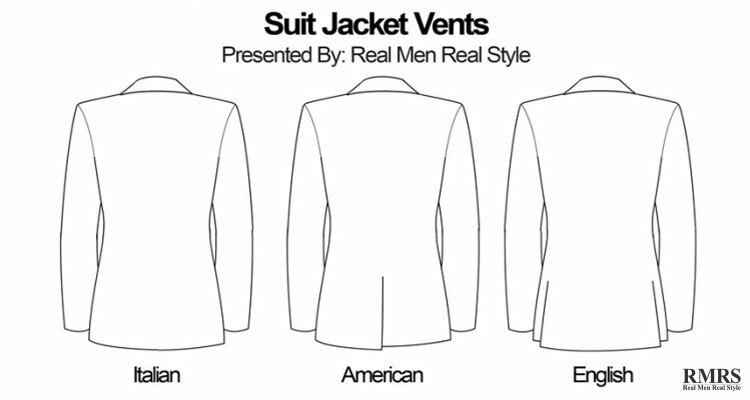 The Italian style is a regular suit jacket with no vents and it’s the most form-fitting. The American style has a vent in the center back of the jacket, about six inches long. The British style has two side vents in the back of the jacket, each one at the outside hip.